Hey everyone! Sorry for the big gap since my last post. My return to GildedNails was a little hampered by some unexpected events - my husband was made redundant from his job a couple weeks ago and then the day after, he was involved in a crazy freak accident at our new house while renovating and hurt his arm very badly. An enourmous 200kg+ aircon unit fell on his arm! I saw the whole thing happen and it was terrible. The final straw, was my laptop packing it in last week! Hey everyone! As you may or may not have noticed, I have been MIA since making my "comeback" after my wedding/honeymoon last year. But I really do have a good reason for not blogging over the past couple of months! My hubby and I bought a house at the beginning of November 2011 and since December we have been engaged in a HUGE renovation project. Unfortunately, I have also been a little unwell for the past few months. It wasn't anything life threatening but it was enough to knock me around for a little while. As a result, the thought of blogging while working full time and renovating a house (while still running the house we are living in at the moment) was just completely overwhelming! Thankfully, the renovations are progressing well, and I'm feeling a little better, so I thought I'd log back in to my little nail blog and write a post! As a result of my haitus, I ended up with a whole stack of polishes that I hadn't reviewed. I considered just starting fresh and not bothering to catch up on the stuff I hadn't reviewed, but a lot of the polishes I have been sent over the past few months are really, really nice! So instead, I'm going to do a few catchup reviews in between showing you some new stuff I have received (like China Glaze ElectroPop! 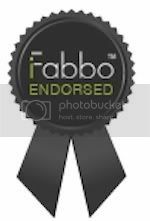 SQUEEEE!). For my first post back, I'm going to do a "catchup" post featuring swatches of three BYS polishes from the High Impact range. There isn't a lot of info available about this collection online, but from what I can tell, they are a range of brightly coloured polishes which have been released for the Spring/Summer season here in Australia and are being sold by Fashion Addict. Brightly coloured clothes, shoes and accessories are right on trend at the moment, so I'm loving these polishes! High Impact Blue - Electric blue frost. Normally I would steer clear of frosts but this is just stunning! Unlike most other frosts I have tried, High Impact Blue applied really well and there were only minimal brush stroke marks. When I first opened the bottle, I was convinced that this polish would be really thin and sheer, but I was pleasantly surprised when I realised I would only need two coats! 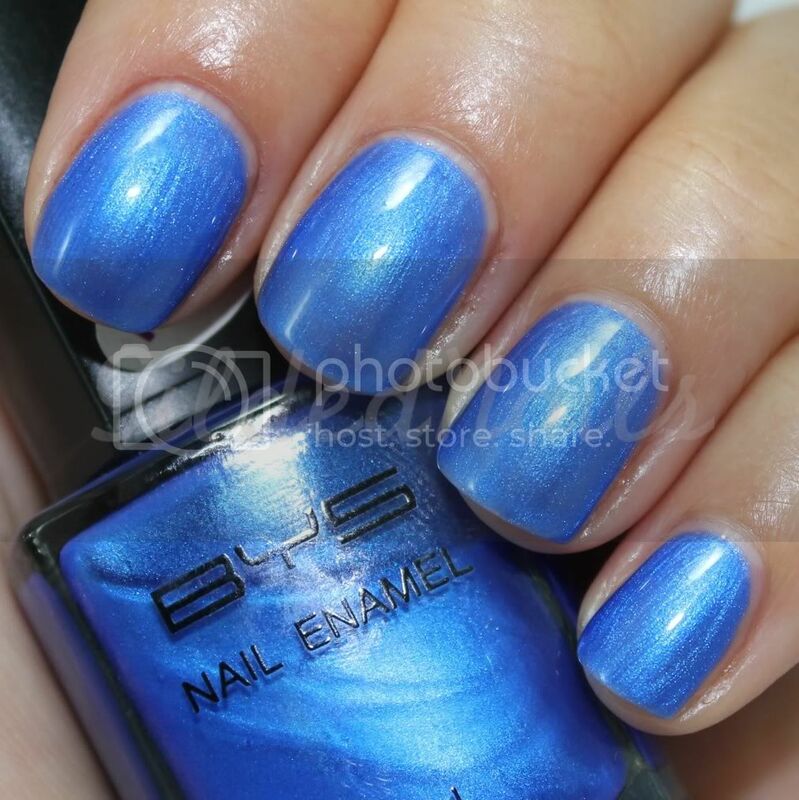 I have always loved vivid blues like this and will generally wear them with any outfit, but if you really want to be on trend, try pairing this nail polish with some bright orange or lime green clothes and accesories! High Impact Green - Sheer yellow/green frost with silvery green microshimmer. Unfortunately, High Impact Green isn't for me, only because the colour doesn't suit my skin tone in my opinion. However, I think darker skinned beauties could rock this polish for sure! There was still some VNL after two coats, so it might be worth layering this polish over white or another green if you wanted the colour to really pop and be opaque. With that said, the shimmer is really gorgeous and it has a super glossy finish! 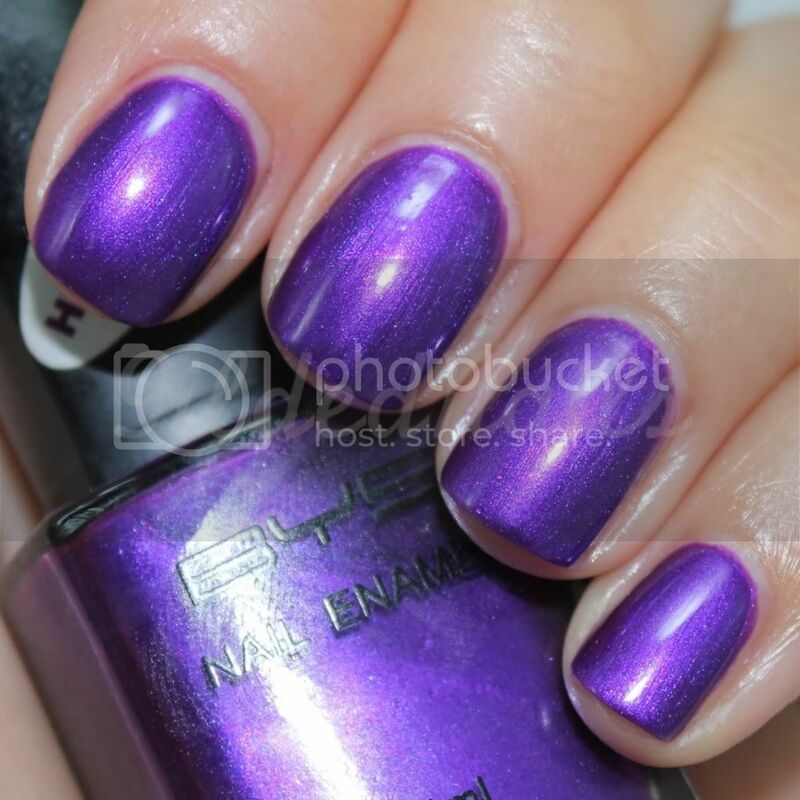 High Impact Purple - Vivid purple with fuschia microshommer. Absolutely gorgeous! I love how bright this polish is and the way the microshimmer flashes in the light. The formula was faultless so I only needed two coats. If you are like me you can't get enough of the colour blocking trend, then pair this polish with orange or lime clothing and accessories. You can probably guess that the Blue and Purple are my faves out of the three! But I think the best thing about these polishes is the price. 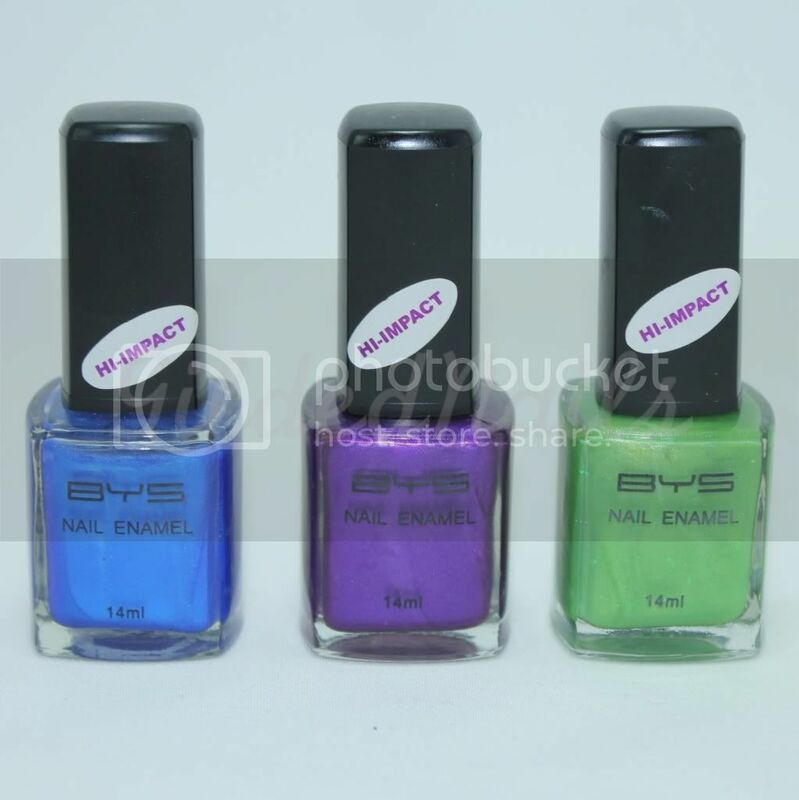 Fashion Addict sells BYS High Impact polishes for only $4.95AUD which is a total bargain! There are three other colours available as well, being Aqua, Orange and Pink. High Impact Orange is calling my name for sure! On a final note, I'm really glad to be back blogging again! Over the past few months I kind of forgot how much I love nail polish and the way it allows you to express so much about your personality. I have had so much fun going through my collection the past few days and organising my ideas for future posts. Here's hoping 2012 will allow me to put a lot of energy into my blog and doing something I really love!